Recently Naima El Bezaz beautifully described her experience of seeing the film Des Hommes et des Dieux by Xavier Beauvois. Her style of description is completely original and authentic but of such a character that I think many Jews can identify with what she writes. The movie is set in the nineties of the last century and is about a group of French monks who inhabit a monastery in the Algerian mountains. It is the time when Islamist terror groups step up their fight against the secular Algerian regime. They sweep the country, devastating and murdering anyone they regard as enemies: Westerners, Muslims who don’t take Islam seriously enough, Christians. It is soon clear that the monks are going to be a target for the terrorists and that actually it is the best for them to leave the country as soon as possible. Indeed, the Algerian government demands the monks to leave, if only to later have no diplomatic row with France. But the monks refuse to leave. They continue to do what they have always done: live with the poor local people, supporting them with equipment and medical assistance. The people of the village feel at home in the monastery and the monks take care of them as if they were their children. Leaving the monastery would be tantamount to treason, the monks have to continue their mission of mercy and protection. There will be no happy end. As this story unfolds in the cinema, El Bezaz describes herself and her feelings while she consumes the film. And then it appears she experiences a reversal of values. 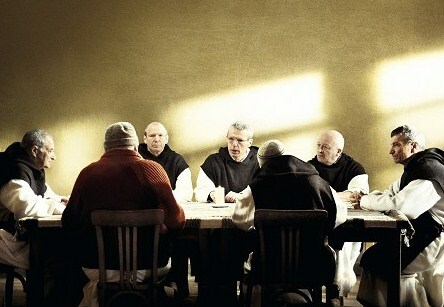 At the beginning of the film she is full of sympathy about so much love and selflessness on the part of the monks. She even feels a twinge of envy for those men who manage to generate such warmth and affection for the poor villagers. In the mosque things sometimes may be quite different! At this point in the film she is still neatly in line with the journalists on the chairs beside and in front of her, who above all seem to be deeply impressed by such amounts of selflessness and charity. They are likely to join the chorus of invariably enthusiastic critics who already made the film receive the Grand Prix at Cannes. But suddenly she feels a deep anger welling up inside. This happens when the monks after long deliberation decide to stay. But why? Where does that anger come from? It’s all about pure love and selflessness, what objection could one possibly have against that? Apparently there is a lot to object against that, such is what El Bezaz shows us. The ordinary Algerians, at least the villagers, are living in a crippling fear. They would pay a fortune if only they could leave. “And then there are those French monks who do have the chance to leave and so save their lives, yet choose to stay where they are”. This triggers the anger and disgust of El Bezaz. It is the combination of the naive dog eyes of the monks and their patronizing superior sacrificing themselves for that pitiful mountain folk which she experiences as an example of imperialist thinking. This description can be read as a debunking of something which is pretty hard to uncover: the violence that lies behind the superiority of complete self-sacrifice. And which is particularly noticeable for those who simply want to bear and continue their own existence. About the vilification of these pursuits by the ‘superior and noble Christianity’ Jews and Israel can have their say. This has got much to do with Thinking for someone else.